Congratulations are in order. OPPO sold over 37,000 F7 units on the first day of sale. Features 25MP selfie camera, 6.23-inch display. 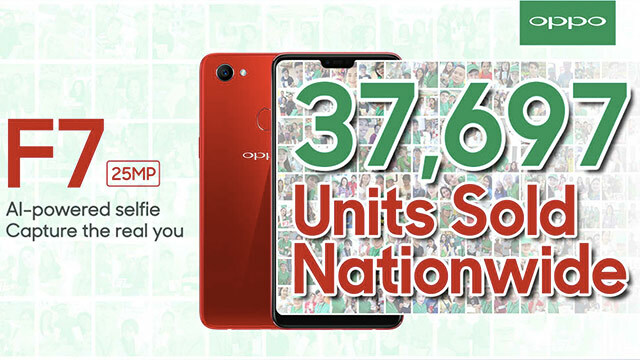 To be exact, OPPO sold 37,697 OPPO F7 units on the first day of sale. This solidifies the brand’s popularity in the Philippines, the selfie capital of the world. The company’s previous record was held by its predecessor, the OPPO F5, which sold over 33,000 units last October 2017. That is one impressive feat. “We are happy with the turnout of the OPPO F7’s first week. This new record is a sign of our growth in the market and a challenge to push ourselves to give the best experience to our customers,” said Jane Wan, OPPO Philippines’ Brand Marketing Director. The OPPO F7 comes with a 6.23-inch full HD+ IPS display, an octa-core MediaTek P60 processor, 4GB RAM, and 64GB RAM of expandable storage. It has a 3,400 mAh, and rear-mounted fingerprint sensor. The phone’s main feature is the 25MP selfie camera with a f/2.0 aperture lens, a new Vivid mode, and AR stickers. The rear camera has a 16MP sensor with an f/1.8 lens, PDAF, AI Scene. The OPPO F7 is now available in stores with a suggested retail price of PHP17,990 (roughly USD346). A 6GB/128GB variant is also available for PHP21,990 in Diamond Black and Solar Red. It is available on zero interest in nine month installments via Home Credit. You can also get one with Smart at Plan 1499, and Globe, also at Plan 1499.